*Contains Minor Spoilers* Tentacle writes about events of the manga. Don’t want spoilers, stop reading. Let’s begin. I’ll try to keep spoilers and plot kills to minimum, but I will mention some of it. I mostly want to talk about the series as a whole. There are 7 volumes you can find, making up 29 chapters, or “acts” as they label them, in this series. You can find 2 omnibus volumes. This is the most commonly seen title on the shelf and it’s nice to have a consolidated book vs seven individual books (limited shelf space). What is this manga about? Well the zombie apocalypse in modern Japan. 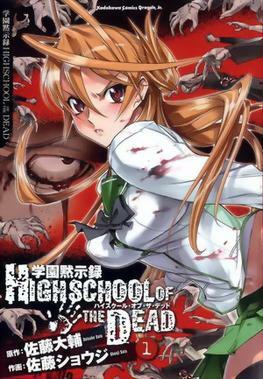 The story follows Takashi Komuro, along with his childhood friend Rei Miyamoto as they navigate the troubles of the walking dead starting at their school. Romance plot: Takashi and Rei, as kids, made a promise to marry each other when they get older. This causes a problem when Rei starts to date Hisashi. He is a friend of Takashi, and is the first “known” zombie we actually see get busted up by Takashi. There is a point where he is turned into a zombie and begins to attack Rei. Takashi of steps in and handles Zombie Hisashi in front of Rei. This leads Rei to accuse him of jealousy and was the main reason he acted out. Takashi basically says, “we are being attacked by zombies, your being stupid”. At some point in the series they reconcile and Rei admits she loves Takashi and doesn’t want him with any other women. So that’s your love story in a nut shell. Character Favorites: Saeko Busujima is the stand out supporting character. She is president of the kendo club and the primary close combatant. She handles the zombies with ease, until she upgrades to an actual katana later in the series. She is this tentacles favorite character for the fact that she has a dichotomy of emotional development that the others don’t seem to go through. She is self aware in the fact that when she is in the rush of battle, she enjoys bashing in the heads of zombies and understands that it’s her nature to be a predator. This awareness bothers her to the point where she feels that she isn’t any difference from the zombies themselves. Mindless killers. There is a point in the story where she decides that it would be better for everyone if she was just one of them, and almost gives up. Of course with a pep talk from the protagonist, she eventually snaps out of it and realizes that she is not the mindless killer that she once thought she was. The development of her character is just the stand out side story (IMHO) of the series. Other characters are Saya, the rich daughter of a politician (who I initially thought was yakuza), and is the logical brain of the cast. She helps in deduction of the zombies and has the logistical mindset for ideas. She plays the big sister to an orphan child they group picks up along the way. Kohta is your “NEET” of the group, if you have to label one. He is is the overweight kid that has a knack for guns. He is kind of the ranged character if you were to compare it to an RPG game. He of course has his own love interest for Saya. He is the hero that has always wanted to be a hero. Once his character gets up and running, he’s pretty sturdy and can jump into the alpha male mindset if need to. Overall cast: The group is a solid (fun) overall cast that looks to stand together as they try to outrun the fall of mankind. Zombie: I love the explanation of the zombies. This is the first real sense I have of zombies are blind but follow sound. It’s “discovered” in this series really well. Final Thoughts: I do love this manga series. I love the anime. I have not seen the OVA: Drifters of the Dead, but I’m sure it’s just as entertaining as the anime. If you want zombie killing, minor fan service, and a fun time (sounds like a tinder profile), then give this one a shot (or baseball bat to the head).